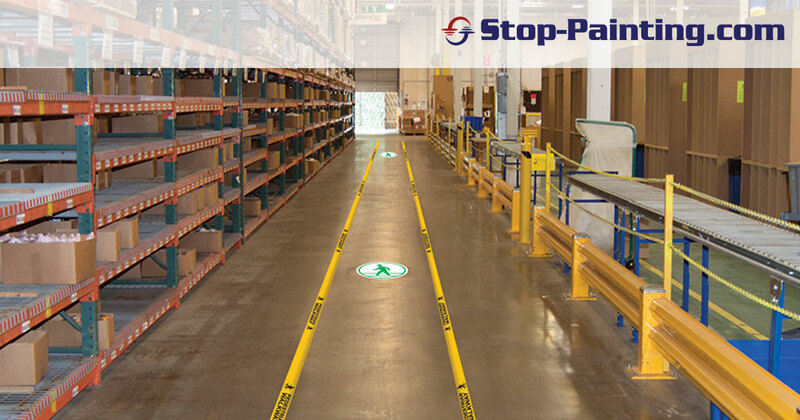 In a busy warehouse or on a plant floor, clear, visual markings for pathways and aisles are important for employee safety and productivity. OSHA provides some general guidelines for floor pathways, aisles and floor markings in facilities – you can read most of them here. All places of employment, passageways, storerooms, and service rooms shall be kept clean and orderly and in a sanitary condition. Where mechanical handling equipment is used, sufficient safe clearances shall be allowed for aisles, at loading docks, through doorways and wherever turns or passage must be made. Aisles and passageways shall be kept clear and in good repairs, with no obstruction across or in aisles that could create a hazard. OSHA does not mandate color, specific designs or products for floor markings. While every facility is going to need something different when it comes to floor markings, there is one thing all workplace floors have in common – they serve as an important safety guide while showing employees safe and productive paths throughout the facility. When managed and designed properly, floor markings can improve safety and cut down on waste. One of the most common uses for floor markings is designating aisles and paths – especially in warehouses or storage facilities. Aisles are typically busy areas where employees traverse the floor while moving products and machinery moves around, also moving products. It is VERY important you clearly mark floors to prevent accidents. Deciding where and what kind of markings to put on your workplace floor should take some careful thought and input from a variety of sources, including employees working on the workplace floor. Think about where and when employees and machines need to be separated, blind spots around corners, size of aisles and placement of inventory. The most innovative technique to applying floor cues throughout a workplace is with a high quality industrial tape. At InSite Solutions, floor marking is what we do and our flagship product, Superior Mark™ tape is the most resilient, most flexible and all-around best tape on the market. Superior Mark™ floor marking tape is produced in-house at InSite Solutions’ facility, using heavy-duty PVC. Competing tapes have an average of 3 mils thickness, while Superior Mark™ Tape is 32 mils thick. The tape is easy to clean and can be removed in one piece. Superior Mark™ Tape is also uniquely constructed with a patented design featuring beveled edges and a recessed adhesive – this helps it stay down when under heavy machine traffic. Companies looking for the most productive ways to mark floors are turning to tape like our Superior Mark™ Tape versus paint. Our tapes are easily pulled up and reapplied quickly, while removing paint, priming the floor for paint and painting can take weeks. Most painted floors offer bright colors, with some stenciling capabilities, but it’s hard to actually apply a message to the marking. With Superior Mark™ marking tape, signs, words and pictures can be applied to give the cues more substance and effectiveness. For instance, a pedestrian walkway is typically marked with painted yellow lines. If you choose the floor tape alternative, you can choose printed tape that reads “pedestrian walkway”, or opt for adhesive footsteps to lead the way throughout the pedestrian walkway. InSite Solutions is one of the few industrial tape companies that offers custom capabilities for its tape products and an online tool that allows customers to upload an image and see what it will look like imprinted on a tape or sign product.